You’re going places. And we’ve got lots of places. The Georgia College campus is filled with interesting and eclectic places. Buildings that represent everything from our rich history to our promising future. The traditional places of Front Campus to the modern places on West Campus. 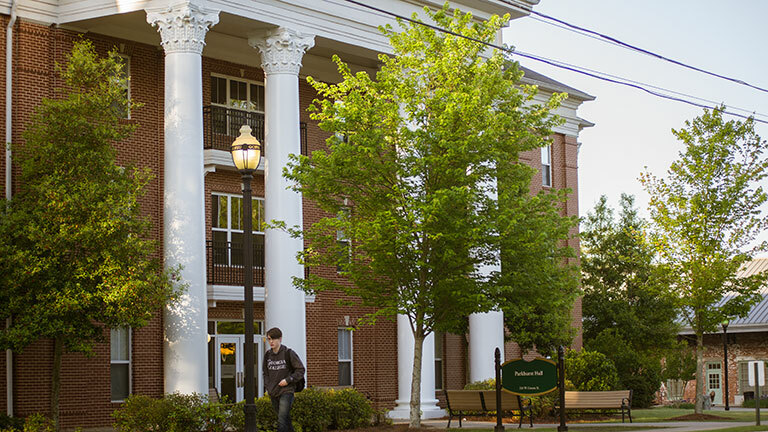 Above all else – the facilities here all have a purpose – to serve you and your educational journey. 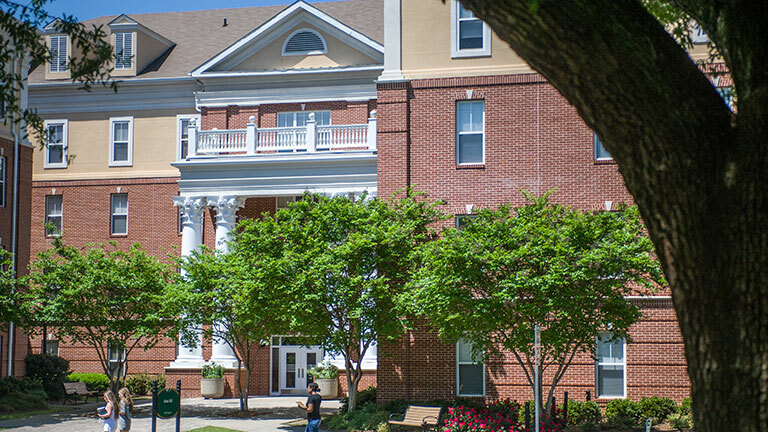 This residence hall opened in 2003 at the west end of Centennial Square. 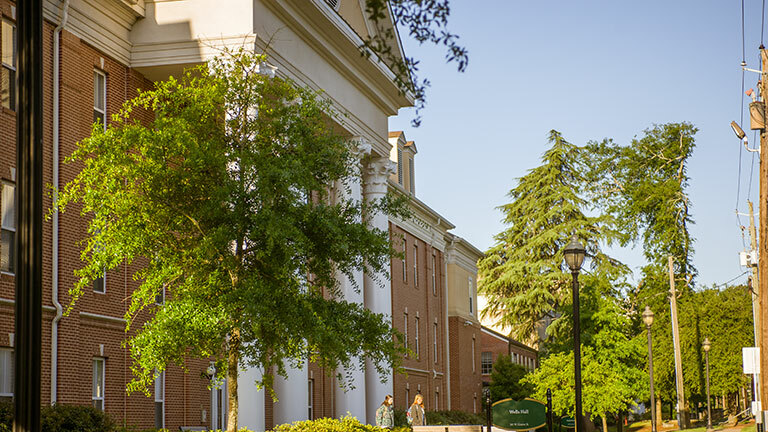 It is called Foundation in recognition of all those who have so generously supported our students and faculty since President Robert E. Lee created the University Foundation in 1959. Next to Foundation is Parkhurst (2003), an imposing structure that replaces the 1949 Parkhurst Hall that chiefly had been occupied by faculty. The first Parkhurst was built with money from the Sylvester Mumford Fund, established by Mumford's daughter, Goertner Parkhurst (1850-1949). Sylvester Mumford was a New York merchant who settled near Waynesville, Ga., and built a stately, antebellum home. The beautiful Goertner Mumford cast a romantic figure in the 1870s as she rode her favorite white stallion through the sand hills and pines of the Brantley County estate. Mrs. Goertner Mumford Parkhurst later used her considerable fortune to support the cause of women's education. East of Parkhurst, elegant Wells Hall (2004) replaced the rather squat, nearly windowless Wells built in 1965. Guy Wells (1892-1965) served as president of what was then Georgia State College for Women from 1934 to 1953. The students from those years (Jessies) remember him with great fondness. Wells was nervously energetic, rather stout and jowly and, according to some faculty, lacking in polish. Whatever his cultural deficiencies, Wells was a shrewd judge of personnel and a genuine father figure for students. In the midst of the Depression and in spite of anemic state funding, the university flourished during the Wells years. Campus building under Wells included Beeson and Sanford Halls, the Health Sciences Building, Porter Hall, the Peabody Laboratory School (currently the John H. Lounsbury College of Education) and the development of Lake Laurel. 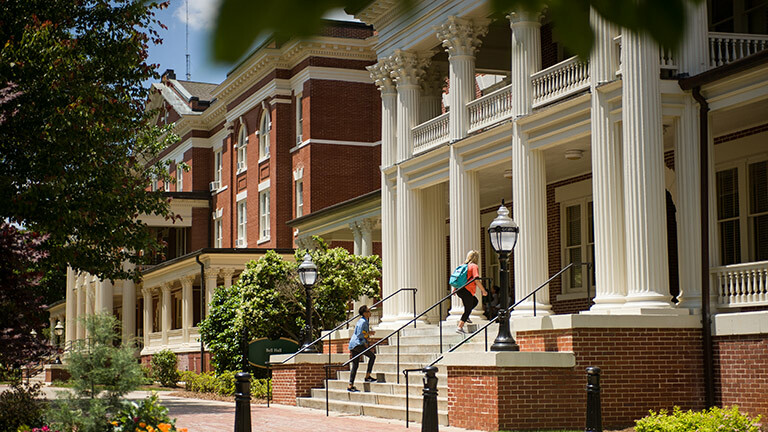 Wells guided the college through the war years (including the Navy WAVES training center on campus) and encouraged active student participation in college decisions. He had a Jeffersonian belief in participatory democracy. Wells stepped down in 1953, exhausted after 19 years and rather discouraged as enrollment rapidly dwindled in the post-War years. Across the street on the opposite corner, Adams Hall (2004) replaced the 1966 Adams Hall. The proximity of Wells and Adams is appropriate, since Ethel Adams, appointed dean of women in 1935, worked closely with Wells throughout his presidency. This energetic and gracious woman from Griffin established and perpetuated many of the college's most cherished traditions. The annual hike to the banks of the Oconee remained a favorite, as did the Halloween Carnival in Nesbit Woods.In 1935, Adams initiated the most vital tradition of all. The freshmen and sophomore classes, aided by juniors and seniors, began vying to produce the best skits and dances. The winning class received a little gold-plated shoe known as the Golden Slipper. These productions became more and more elaborate, and, from 1935 to 1972, nothing better expressed the sense of sisterhood and community at this college than Golden Slipper. If the spirit of Dean Adams pervades Adams Hall, it is a very special place indeed. 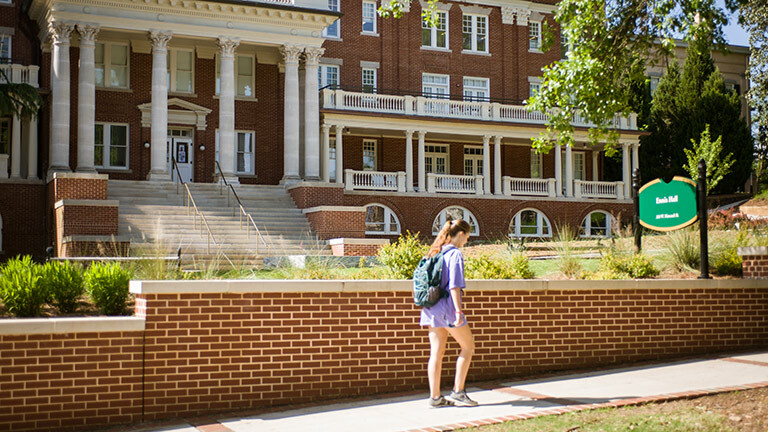 East of Wells Hall, Sanford Hall, erected in 1938, has been carefully renovated, preserving its fine architecture while upgrading the facilities. 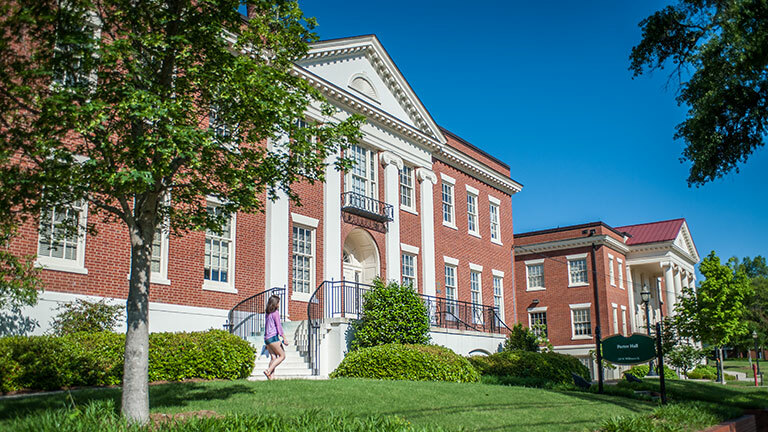 The hall was judiciously named for Steadman V. Sanford (1871-1945), president of the University of Georgia (1932-1935) and Chancellor of the University System from 1935 until his death in 1945. Chancellor Sanford (who also has the football stadium at UGA named after him) was a towering figure in the expansion of higher education in Georgia and a good friend of President Wells and GSCW. In 2004, at the rear of Sanford Hall, a rambling Napier Hall (1971) was demolished and a new Napier (2005) arose. 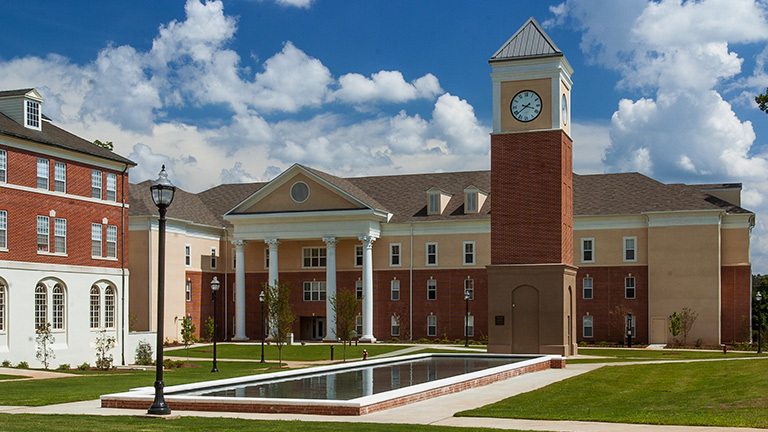 This residence hall is named for mathematics professor Alice Napier. In a 1943 Colonnade poll, Napier was voted the college's "all-time, greatest teacher." Napier literally devoted her life to Georgia College, teaching mathematics here from 1893 to 1946 – an amazing 53 years! A precise, fastidious woman who cared deeply about the young women she taught, she was the founder and perennial advisor of the local YWCA chapter, and taught Sunday School in the Methodist Church. Many of her students, such as Euri Belle Bolton and Sara Nelson, became luminaries at the college in later years. For many of the young women at Georgia Normal & Industrial College and Georgia State College for Women, Alice Napier embodied the institution. Constructed in 1928, this large residence hall, now the central residence of the Honors students, was named for Miller S. Bell, a strong supporter of Marvin Parks. Bell served as mayor of Milledgeville from 1908 until 1924, matching his friend Parks in his energy and determination to bring the old town into the 20th Century. In 1908 he was named a member of the board of directors for the college, and was later appointed to the Board of Regents. The Ina Dillard Russell Library was designed to fit the collaborative, liberal arts learning model of the university. 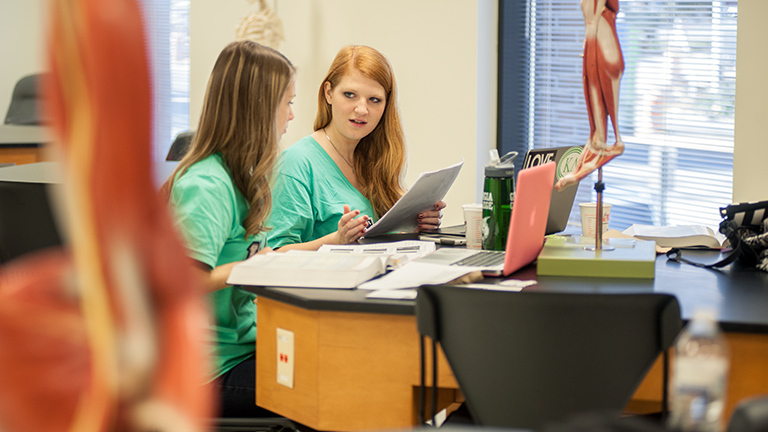 It is filled with diverse resources, innovative and practical technology, and expert staff eager to assist students with their research and exploration. 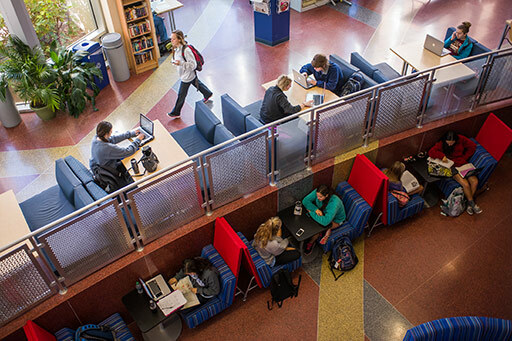 The library also includes several types of quiet study areas for both individuals and groups. And when you’re ready to close the books, you can catch a quick snack or a latte at the Books & Brew. 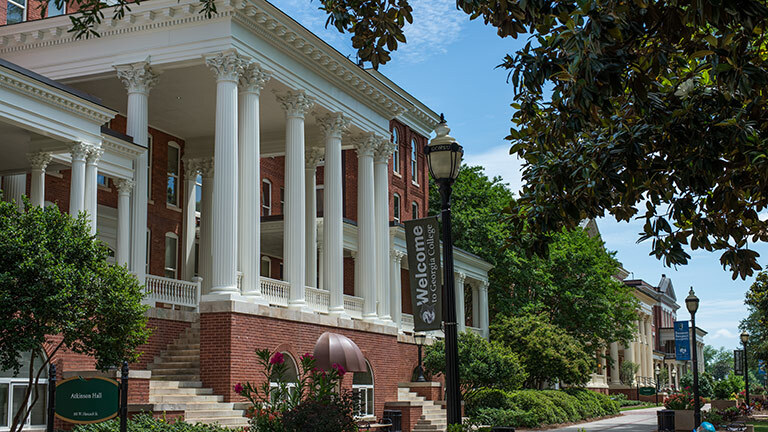 Atkinson Hall, constructed in 1896, is, next to the Old Governor's Mansion, the oldest and most stately building on campus. 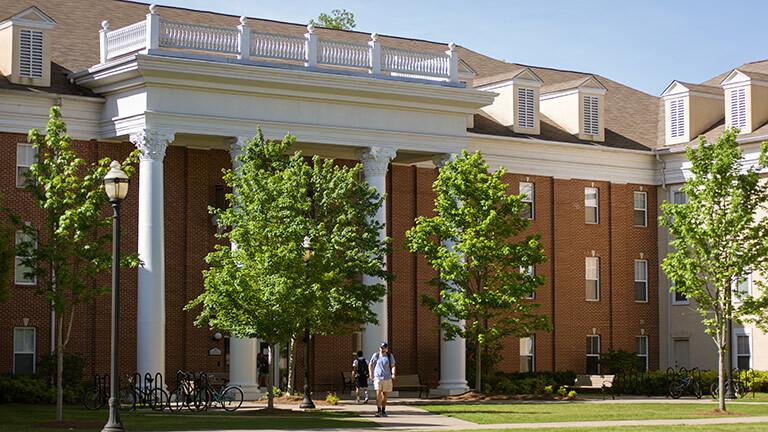 In 1977-78, through the vigorous intervention of alumni, community, faculty and students, Atkinson was saved from the wrecker's ball and renovated. 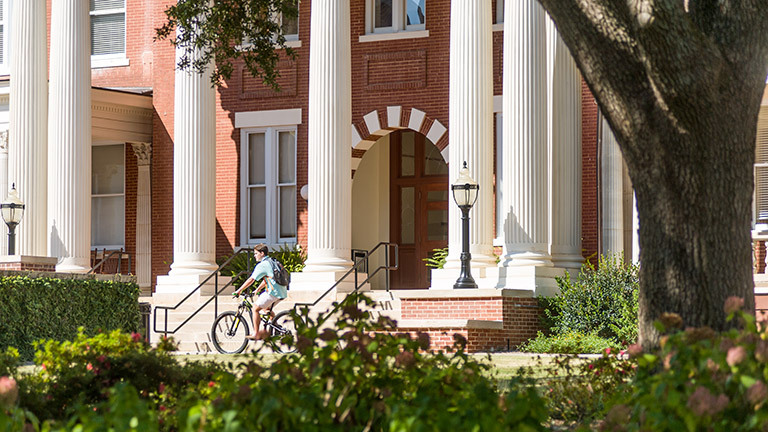 It has served since as the home of The J. Whitney Bunting College of Business. The structure is named for William Y. Atkinson and his wife, Susan Cobb Milton Atkinson. Susan was sensitized to the plight of under-educated women in Georgia by her journalist friend, Julia Flisch, and she persuaded her husband, a young state legislator from Coweta (and future governor), to introduce the bill that created Georgia Normal & Industrial College in 1889. This beautiful space, which has witnessed hundreds of plays, convocations, concerts and readings from the likes of Carl Sandburg, Cornelia Otis Skinner, Glenn Miller, Bob Hope, Alex Haley, and Isaac Stern, is appropriately named for Judge Richard B. Russell (1861-1938). In 1887, at age 26, Russell introduced the first bill to establish a publicly funded women's college in Georgia. Even though his bill failed, Russell remained one of this college's staunchest supporters, serving as president of the board of directors from 1918 until 1932. The facility, constructed in 1926, was named in his honor. His visage still may be seen on the porch of Russell, benignly viewing concert goers as they enter. Chappell Hall was constructed in 1963 on the site of an earlier and much more elegant Chappell (1907) that had deteriorated. 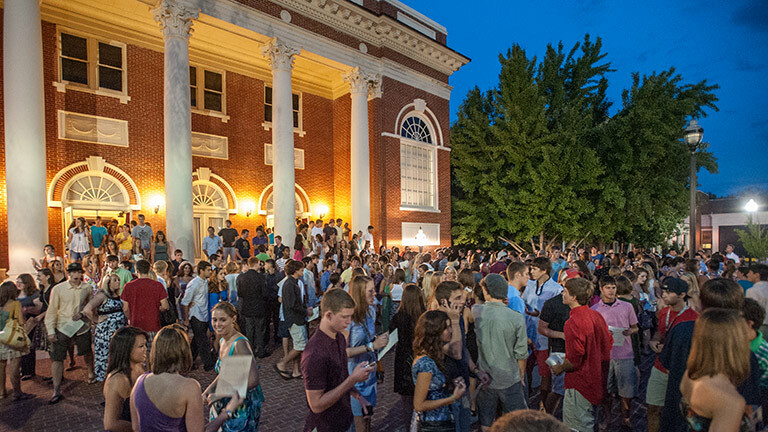 The current Chappell houses a multitude of campus agencies. Both Chappells were named for our first president – J. Harris Chappell. Chappell (1850-1906) introduced a strong, liberal arts component into the curriculum of Georgia Normal & Industrial College, the major purpose of which had been to train young women to be clerks, secretaries and teachers. Both of these historic structures are named for the man who, more than any other president, guided and shaped the destiny of the college – our second president, Marvin McTyeire Parks (1872-1926). 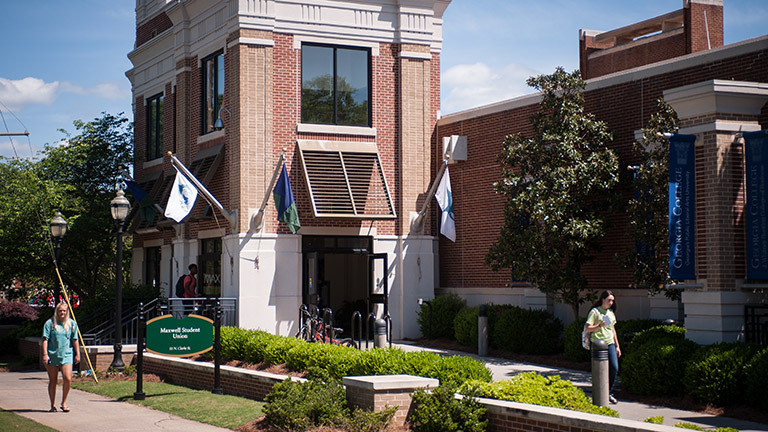 Parks successfully battled to turn the then teacher's school into a four-year degree granting institution known as Georgia State College for Women. Parks was both revered and feared by his students, and his untimely death in 1926 shocked the college and community as few events have. Parks Hall (1911) was named for him in 1913 while he was still president. The Marvin M. Parks Memorial Building (1928) was erected with donations from alumnae to commemorate this beloved president. 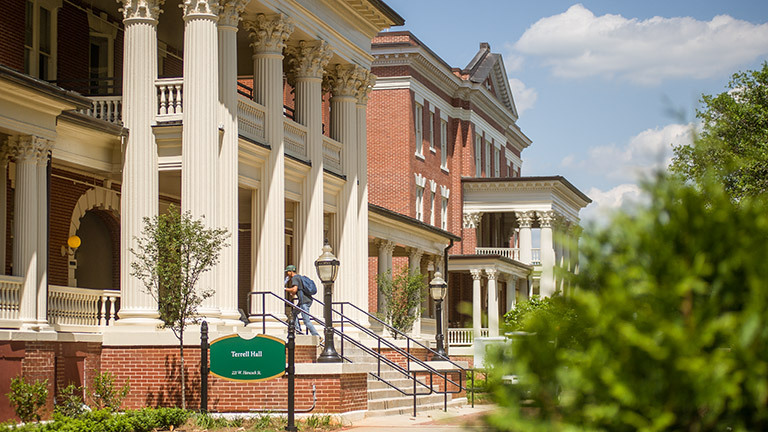 This graceful old residence hall was constructed in 1908, and no building on the campus has more completely preserved its architectural integrity. The building was originally named Lamar Hall in honor of R.N. Lamar, one of the original members of the Board of Directors. Lamar, however, was not a strong supporter of Parks and, in 1913, Parks' allies on the board changed the name to Terrell Hall in memory of the recently deceased Joseph M. Terrell, who had been the Georgia governor from 1902 until 1907. This large structure, built in 1972 on the southwest corner of the campus, houses the campus dining facilities, a book store, and other facilities that can revive famished spirits. The rather severe, 70s look of Maxwell has been greatly softened by extensive exterior renovation in the late 90s. This vital campus center was named for one of the finest teachers ever to grace this university. Mary Thomas Maxwell (1902-1970) taught in the English Department here from 1939 until 1968. Kilpatrick was dedicated in 1977. 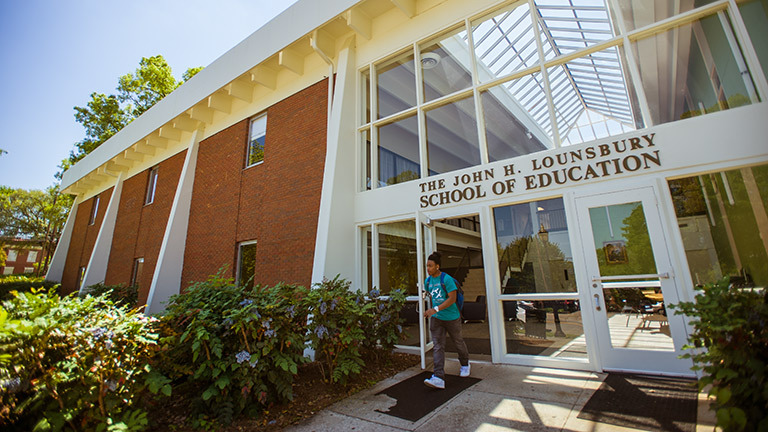 Located on West Montgomery Street, it houses the John H. Lounsbury School of Education. The building's east wing is dominated by a beautiful atrium, and its west wing was formerly the Peabody Teacher Training Building (1939). William Heard Kilpatrick (1871-1965) was a Georgian who taught at Columbia Teachers College, and was one of the nation's leading exponents of the ideas of Pestalozzi and John Dewey. The Music and Theater Building facing Wilkinson St. was constructed in 1939 over and around a 1912 steam plant, partly with Public Works Administration money and partly by funds from a bequest by Louisa Porter Gilmer Minis of Savannah. Mrs. Minis wished the building to be named for her great-uncle, Anthony Porter, a wealthy Savannah planter and merchant, who had once served as secretary to Gov. David Brydie Mitchell. The construction of Lanier Hall was personally supervised by President Marvin Parks in 1925 and 1926. Classroom space was badly needed after fire destroyed the Old Main Building in 1924. It was first known as the New Classroom Building and, later Arts Hall. 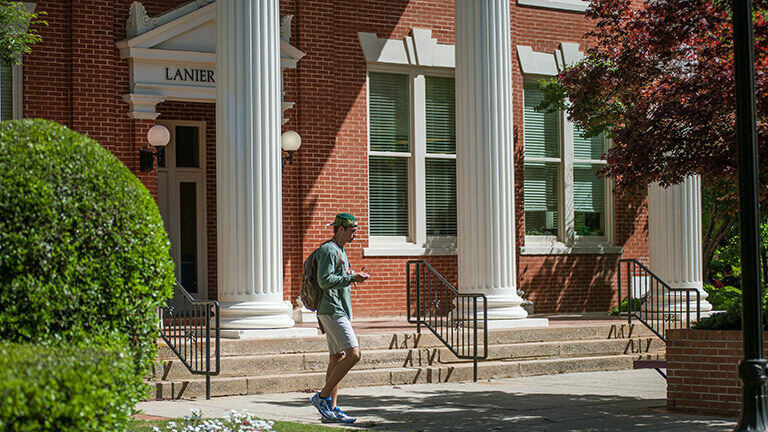 In the 1950s, Arts Hall was re-named after central Georgia's renowned poet, Sidney Lanier. No longer used for classrooms, Lanier now houses an array of services. Dedicated in 1920 in honor of Sen. J. Howard Ennis (1873-1953), who had fought successfully, together with President Parks, to ensure that GN&IC would be adequately funded, able to confer four-year degrees on its graduates, and no longer considered a "department" of the University of Georgia. Ennis later served as mayor of Milledgeville from 1924 until 1927. 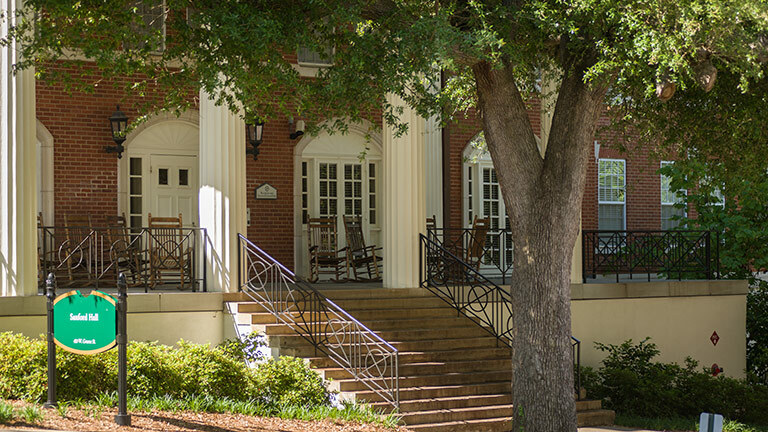 On Wilkinson St., across from the main campus square, lies Herty Hall, the abode of biologists, chemists, physicists and astronomers. The college had long needed a science building and, under the leadership of President Henry King Stanford, the "Science Building" was opened in 1954. In May, 1956, it was named in honor of the renowned chemist, Charles H. Herty, and a major enlargement of Herty Hall was completed in 1972 and a second expansion was completed in 2011 to add new laboratories, a rooftop greenhouse and observatory. Charles Herty (1867-1938) was born in a house located on what is now our front campus. After receiving his doctorate from Johns Hopkins, he taught chemistry at the University of Georgia from 1891 until 1902. Herty was known for developing the cup and gutter system which made it easier to extract gum from pine trees for turpentine (a system which extended the life of the trees) and, in later life, he headed a laboratory which developed a process for using southern pine instead of northern spruce for newspaper print. Herty also developed the athletic program at UGA, organizing its first football team in the 1890s (there is still a Herty Field on the campus).